Hi everyone! I’m turning 44 this year and keeping the tradition of what I started last year - camping at Angel Island in March to celebrate my birthday. It’s a low season for the island but it’s usually really beautiful and serene. I hope you can join us for either overnight or a day trip on Saturday. There’ll be a bbq on Saturday afternoon, so you can also just join us for that. Our campsite is only 1.5 miles from Ayala Cove where the ferry will drop you off. It has a steep trail from the cove up to the main fire road, so don’t pack too much or you’ll be sweating lots. The camp site is called site 10 or kayak camp. It’s a group tent campsite with garbage and a small bbq stand. There are quite a few flat places that you can pitch your tent, probably big enough to fit ten 2-3 person tents. Make sure you bring your rain flies, since we’re still in spring and it could rain or dew heavily. There are no wood fires on the island but we’ll either use the bbq stand or a fireman to have charcoal fires for warmth and bbq. There are bathrooms about a 3 minute walk from the campsite with running water. There’s water on the top of the hill from the campsite. We’ll have a large water container at the campsite that we can refill, so you don’t have to go up there every time you need to refill your water bottle. No wifi at the campsite but cell signal is pretty good if you walk to a clearing. If you’re only planning to come for a day hike or a bike ride, Saturday will the best. You can take a ferry, hike and join us for the bbq. I’d recommend biking because you’ll be able to see more of the island that way. If you’re an experienced hiker and would like to lead a hike from kayak camp at 11:30am - let me know. For day hikers, bikers and paddlers, bring something to share for the BBQ. If you want to volunteer for for one of the above, make sure it’s an easy one pot meal. Best if it is pre-made and can just be heated. We’ll have a small commissary with the basics, a two burner stove, and two pots. For Saturday day paddlers: If you want to circumnavigate Angel Island with us and paddle on Saturday, you’ll be on your own in terms of paddling to and fro Angel Island. I recommend you put in at Tiburon, it’s the shortest distance from the island crossing Racoon Strait. Meet us at 9am at the beach between Point Stewart and Point Lone. There’s a couple of pilings for the old pulleys sticking out of the water, you can’t miss it. We’ll paddle around the island and you can paddle back to Tiburon during slack at 3:3pm after the bbq. Note you’re on your own for the Racoon Strait crossing, so make sure you have a partner/partners or feel confident as an advance paddler to do the crossing alone. Racoon strait is an active ferry and boat channel and there can be a lot of boat traffic from various angles. Parking at Tiburon can be somewhat tricky, but there’s a few parking lots around Sam’s restaurant. You can put in at Sam’s restaurant and around the ferry terminal. You can park overnight at the harbor parking lot. The gated entrance is $12 per day for 24 hours, it will only let you stay 48 hours. But you can go into the office and pay extra $12 for the third day if needed. Board and equipment: I won’t be able to bring boards for you. If you want to paddle the Richmond to Angel Island and back (7 miles one way) and rent a board, you’ll need to pick up a board from Mike’s Paddle in the morning and drive it to Richmond. Same on the return. Also same for the day paddlers for Saturday - you’ll need to figure out how to transport your own board or the rental board. Since it’s my birthday - rental is discounted. 🙂 Best to use a 12’6 or 14 if you have your own board - boards shorter than those will be too slow for the trip. Home sweet home! It's the last paddle of the bay! I was excited that after about a month of paddling, I was finally getting back to where I started. When I started I had no idea whether I would be able to finish because of all the storms that we had in January. I was prepared but it was quite an undertaking. Lucky for me, the good weather continued and we had beautiful sunshine for the last day. On January 29th, 2017, I paddled with Suzie Lee, Carlo Maravilla, Ben Chiang, Amy Mosbey, Sean Mosbey and Gary Leong from Treasure Island to Mike's Paddle in Alameda. This was definitely an advanced paddle as well because for half of the way, we were paddling in the high traffic area leading to the Oakland shipping lanes. Although I checked that morning's ship log and no big ships were passing through, there's still a lot of current going between the Bay Bridge and the Rock Wall in Alameda. We left early around 9 when it was still pretty cold outside. We paddled to the back side of Yerba Buena Island and hung out with the harbor seals for a little while. Then we headed towards the Oakland Estuary and encountered pretty strong flood. The eddy behind one of the buoys was about 20 feet long and you can clearly see the current spreading around the buoy. After we reached the safe harbor of the rock wall, everyone relaxed and we were able to explore the navy ships in Alameda. We took some pictures and then headed back to Mike's Paddle. Hazards: Advanced paddlers only, boats, shipping lanes, wind and current. Put-in: Treasure Island has a couple of places to put in. Clipper Cove is probably the easier put in because it's sheltered. The unfortunate thing is that the ramp next to The Winery SF is steep and slippery - definitely not a one person carry and put in operation. For this put in/take out, we would stage a person in the water and a person near shore to help a paddler get into the water. Group effort is needed! There's another place near the north end of the island which is under construction at the moment and will likely be for a while. You'll have to carry your board a ways and also go down a boat ramp with slippery seaweed. The north end is a perfect place to put in for downwinders going towards Emeryville/Berkeley/Richmond depending on which way the wind blows. Take-out: Mike's Paddle in Alameda. The best SUP shop in the Bay Area! On January 28, 2017, it's the weekend and I got a lot of paddlers psyched to paddle around their neighborhood! I planned a couple of paddles: one was from Emeryville to Treasure Island a nice 4 mile paddle crossing the bay bridge and another one was my favorite circumnavigating Treasure Island and Yerba Buena Island about 6 miles. Both of these paddles requires quite a big of navigation and watching out for boats and currents because we are now in the busy channels crossing the bay bridge and paddling between Treasure Island and San Francisco, where there's a lot of commercial boat traffic. Saturday morning was perfect, very little boat traffic and we coasted from Emeryville to Treasure Island. Nat Chan, Dave Burdick, Carlo Maravilla, and I went pretty quickly through the Bay Bridge. Carlo as usual was faster than most of us and sprinted back and forth between us. Nat and Dave did really well as intermediate paddlers. Once we reached Treasure Island clipper cove, we met up with Amy Mosbey and Sean Mosbey. We then paddled around Treasure Island counter clockwise and under the west span of the Bay Bridge. On that side of Treasure Island, there are some great rollers if you're into downwind surf especially in the summer time. The tug boats also kick up a lot of fun waves as well. Paddling under the Bay Bridge and next to Yerba Buena definitely shows the wild character of the island agains the urban jungle of San Francisco across the bridge. We were able to find a little peace and harmony on the back side on a small beach to chill. As we circumnavigated, we also found many young seals in the back side of the island - as many as 40 I counted. It must be the good currents that go under the bridge that attract that many harbor seals. The moms were not amused at our presence so we quickly left the area. Front there, we paddled in more calm water under the east span of the Bridge and back to Clipper Cove. Hazards: too many to count - this paddle is definitely not for beginners and maybe not intermediates if you don't know anything about marine traffic, wind and current. You should follow someone else the first time and learn about navigation. Put-in: The Emeryville Marina is a favorite for a lot of stand up paddle board downwinders and kite boarders. KGB - a favorite local kite board outfitter is based out of there. Barbary Ghost - a local favorite trawler boat operated by Drew - is a great provider of downwinders as Captain Drew can take six downwind boards and take you wherever you want on the bay and pick you up at the end of the run. The marina itself is easy to park (with a fee) and has porte-potties. Take-out: Treasure Island has a couple of places to put in. Clipper Cove is probably the easier put in because it's sheltered. The unfortunate thing is that the ramp next to The Winery SF is steep and slippery - definitely not a one person carry and put in operation. For this put in/take out, we would stage a person in the water and a person near shore to help a paddler get into the water. Group effort is needed! There's another place near the north end of the island which is under construction at the moment and will likely be for a while. You'll have to carry your board a ways and also go down a boat ramp with slippery seaweed. The north end is a perfect place to put in for downwinders going towards Emeryville/Berkeley/Richmond depending on which way the wind blows. On January 27, 2017, Carlo Maravilla, Hong Chin and I had a short and uneventful paddle from Richmond Inner Harbor to Emeryville Marina. After all those days of paddling, I was getting a little tired and it was nice to have a short 6 mile paddle! The winter summer days were back and I was glad to paddle in the Sun! From Richmond to Emeryville, you get the full bay view from Bay Bridge to Golden Gate Bridge including Treasure Island, Angel Island and Brooks Island. We truly live in a fantastic paddling location. Both marinas are great for put in and take outs and shuttle is easy! The only issue is wind, so try to get your paddle done early otherwise you'll be fighting a lot of wind coming from the gate. Hazards: boat channel in front of each of the marinas and ferry boats. Put in: Richmond harbor has several places to take out. My favorite two are both in the inner basin. There is a public dock at the Marina Bay Yacht Harbor with wide ramps and docks. The unfortunate thing is that the parking lot is $5 for parking. You can also park just on the outside of the parking lot but there are only three or four spaces for free. The rest belong to the office park. The other take out is further in the marina next to the restaurant Salute. Sometimes the dock is closed though in the winter. One time I took out there and we had to climb over the rocks along shore with our new carbon boards which was not fun. There's a big grassy area next to the restaurant for hanging out after the paddle. Take out: The Emeryville Marina is a favorite for a lot of stand up paddle board downwinders and kite boarders. KGB - a favorite local kite board outfitter is based out of there. Barbary Ghost - a local favorite trawler boat operated by Drew - is a great provider of downwinders as Captain Drew can take six downwind boards and take you wherever you want on the bay and pick you up at the end of the run. The marina itself is easy to park (with a fee) and has porte-potties. On January 26, 2017, the weather continues to be just GORGEOUS! Stephanie Martin and I paddled from Point San Pablo Harbor to Richmond Inner Harbor Basin. This is definitely one of the best paddles around the bay. From the rustic areas of Point San Pablo, you visit a couple of islands (one of which has a BnB), go under the Richmond/San Rafael Bridge, and then head into the semi-industrial area of the Richmond Harbor eclipsing Brooks Island Regional Reserve. After this many days of coordinating with various people paddling and something is about to go wrong. Stephanie and I showed up at the put-in and realized that we didn't have the right fin for her inflatable board. Thank you for whoever invented the buckled strap, we jerryrigged the fin into the fin box and managed to paddle the entire 8.5 miles. Between the east bay and Marin, there are seven islands, some small and some big. During paddle of the bay, I managed to go next to all of them. The two islands that we paddled on this day are the brothers (remember we paddled the sisters a few days earlier) and Red Rock Island. The Brothers hosts a lighthouse bed and breakfast during the season on the East Brother. It looks like an awesome place to stay except since you are staying on the lighthouse there is a fog horn going off every 5 seconds. That's enough to keep me away, but sure sounds like a romantic place to take a date. Paddling under the Richmond/San Rafael Bridge is fun, albeit you have to deal with the ferry again. On this day we had a short stare-down with the ferry and eventually they veered off. Once you pass the bridge, you'll have to start figure out how to get to the inside of the Richmond Harbor. The harbor is quite big with various inlets and marinas, so make sure you know which marina you're going to take out. Brooks Island is managed by East Bay Parks. The island is off limits unless you are part of the tour managed by the park because there are colonies of terns and herons roosting throughout the year. The caretakers of the island are really nice though, you can get more information about how to visit the island through the East Bay Parks website. Stephanie and I had a great time on this paddle because once again we were blessed by great weather. We spent about 3 hours on the water with relative ease until the very end when the wind kicked up a little bit. Hazards: Richmond/San Rafael bridge, ferries and islands. Put-in: If you haven't been to Point San Pablo Marina, it's a treat. And it's a very well kept secret in the Bay Area. Nestled behind Point San Pablo which is directly next to the Richmond/San Rafael Bridge, this marina is like none I have seen. First you basically need a high clearance off road vehicle to just get to the marina. And then when you get there it feels like a lawless western town. Don't worry the people at the marina are super friendly and they live on house boats and all kinds of cool yachts with a lot of character! There's a bathroom that you can use and also a cool bar during spring and summer season. Take out: Richmond harbor has several places to take out. My favorite two are both in the inner basin. There is a public dock at the Marina Bay Yacht Harbor with wide ramps and docks. The unfortunate thing is that the parking lot is $5 for parking. You can also park just on the outside of the parking lot but there are only three or four spaces for free. The rest belong to the office park. The other take out is further in the marina next to the restaurant Salute. Sometimes the dock is closed though in the winter. One time I took out there and we had to climb over the rocks along shore with our new carbon boards which was not fun. There's a big grassy area next to the restaurant for hanging out after the paddle. On January 25, 2017, I paddled from Bay Front Park in Pinole to Point San Pablo Marina with Carlo Maravilla and Robin Hartford. The storms were going away at least for a few days and we were looking at several beautiful winter days with very little wind. Stoked! In this section of the bay, there aren't too many land marks so we had to figure out the navigation by looking at the points jutting into the bay. First point was Point Pinole which is a regional park. I had originally planned to camp there illegally but decided to wimp out. It looks like a nice park with a good beach. The second point is Point San Pablo and the marina is just on the north sheltered side of the point. Carlo has a lot of energy and we chased for a couple of tug boat waves which weren't that great. But we had some fun figure out some racing techniques. Robin headed directly for the points and hung out in the sun. It was great to have the nice weather back. I remember lots of days like this, 60-65 degrees, 5mph wind or less, and just glassy conditions during the California drought years in the winter. This year we had been pummeled with rain and it didn't stop until May. In January more than half of the days were rains and I guess I was lucky because I got to enjoy all the south wind while I was paddling north and now I'm paddling south there aren't any storms to contend with. I was sure glad to have the good weather back! Put-in: This section of the bay is rarely mentioned by other paddlers. I'm not sure why - maybe because it's a bit further from the population centers and also perhaps there aren't any paddling clubs outside of Benecia. There are also not that many access points, so when I found Bay Front Park in Pinole, I was really excited! This little gem is nestled next to Pinole Creek. The winter flow was ample on the creek and plenty of winter birds are nesting. It is situated next to a PG&E station but they have put in some good infrastructure in the park. I was able to find a nice little beach to take out and Lyft was easy to find as well! Take out: If you haven't been to Point San Pablo Marina, it's a treat. And it's a very well kept secret in the Bay Area. Nestled behind Point San Pablo which is directly next to the Richmond/San Rafael Bridge, this marina is like none I have seen. First you basically need a high clearance off road vehicle to just get to the marina. And then when you get there it feels like a lawless western town. Don't worry the people at the marina are super friendly and they live on house boats and all kinds of cool yachts with a lot of character! There's a bathroom that you can use and also a cool bar during spring and summer season. On January 24th, I paddled alone from Glen Cove Marina in Vallejo to Bay Front Park. It was right after the storm and although there were still some left over wind, it was a gorgeous morning. Paddling out of the Vallejo Bridge was a breeze with the Delta current and I managed to put on after the morning ferry traffic. The wind was coming out of NE so I actually had some small glides paddling along the refinery. It's a bit surreal to paddle next to the refinery - reminded me of early 20th century industrial revolution in a way. The scenery in the north bay can be amazing in the winter with the clouds. The juxtaposition between the refinery on the east side and the rolling green hills on the west side shows how the economy differs between Marin County and Contra Costa County. Occasionally you see the Amtrack trains rolling along the east bay waterfront - definitely one of the best views on the train in the bay area! After the lyft ride back to Vallejo, I was off to find a place to have lunch. It turns out in the sleepy town of Crocket, there's a great little place called Judy's Place! My wife's name is Judy so I had to go check it out. Judy was at the counter and I ordered some great fish tacos. She does the shopping herself with mostly organic and healthy ingredients which is kind of rare for a little Mexican/Salvadoran restaurant. Highly recommended! Hazards: Vallejo bridge can be intimidating. Stay close to the pillars and be aware of boat traffic in front and behind. The ferry between Vallejo and San Francisco can be very fast - so watch out for them as well. One cool thing is that the ferries don't actually kick up big waves, which is a plus for paddle boarders. The refinery can also be a little tricky with piers falling apart so be careful if you want to ride underneath them. Put in: There are multiple places to take out in Vallejo. Lots of Marinas and even more public ramps in Benicia. The Benecia Outrigger Club is a great resource around there. I'm not sure whether it would be okay to take out in the summer time at Glen Cove Marina, but in the winter there was no one there so the guest dock was open to the public. Take out: This section of the bay is rarely mentioned by other paddlers. I'm not sure why - maybe because it's a bit further from the population centers and also perhaps there aren't any paddling clubs outside of Benecia. There are also not that many access points, so when I found Bay Front Park in Pinole, I was really excited! This little gem is nestled next to Pinole Creek. The winter flow was ample on the creek and plenty of winter birds are nesting. It is situated next to a PG&E station but they have put in some good infrastructure in the park. I was able to find a nice little beach to take out and Lyft was easy to find as well! 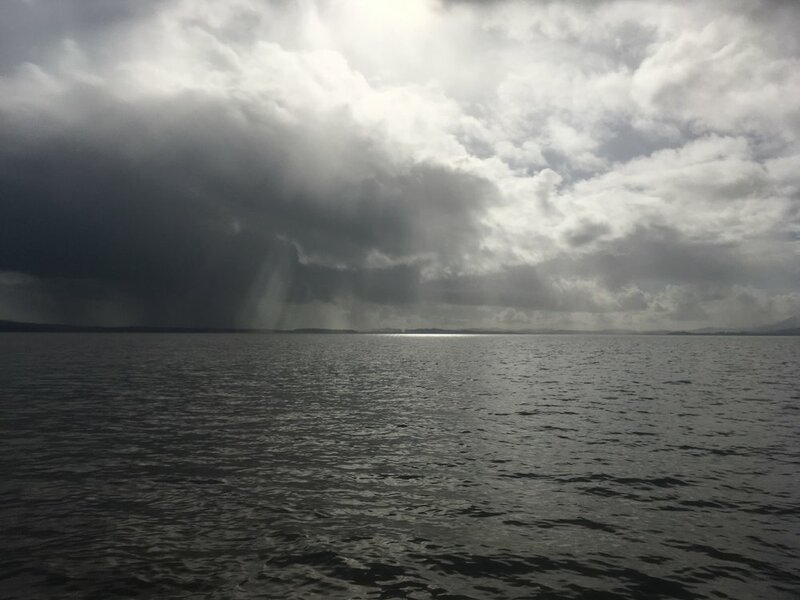 The entire North Bay is a long exposed paddled but with scenery to die for especially during a stormy winter day (see below). It is situated next to a very large San Pablo Bay National Wildlife Refuge managed by US Fishing and Wildlife. The amount of birds I saw was incredible in the winter time. And compared to the south bay, this area is so much wilder. You really feel like you're alone here which I guess can be good or bad. Coming into Vallejo can be just as intimidating because the Carquinez Bridge spans more than half of a mile and the Sacramento Delta and the Napa River drains out of there. The current at the bridge can be very strong during the winter because of the runoff in addition to the tides. There are also ferries that runs from Vallejo to San Francisco during commute hours and they are FAST. You can break up this section to some smaller paddles around the San Pablo National Wildlife Refuge. Sonoma Creek would be interesting to explore; Skaggs Island must be a nice place to paddle; Napa River is of course a great place to paddle as well. The issue with this long paddle is that you need to be self-sufficient and have stamina. Even under favorable conditions, it took about 5 hours to paddle about 17.5 miles (with some detours see below). Bring plenty of food, water and layers. On January 19th, I paddled this stretch by myself with Isabella Wilk driving shuttle. I caught a nice day between the winter storms with supposedly W/SW wind and slack to flood tides. It was a beautiful day with fantastic rainbows looking to the north that pretty much followed me the entire day. There was some small rain storms, but very minimal. Sometimes the wind would shift directions but I had it easy most of the time. The current was fairly strong near the bridge with the delta draining out. There was a lot of floating debris - large trees and branches. I caught the ferry wake a couple of times passing the bridge. The wakes were pretty small compared to the wakes near Golden Gate bridge, but the speed of the ferry was much faster. Hazards: Long exposed paddle, make sure you bring a marine radio for emergencies calling for the coast guard. Even when you call them it could take a long time for them to get to you because they have to come from Vallejo. Carquinez Bridge and the ferries are also major hazards. Put-in: Outdoor Adventures has their put-in site at Buck's Launching and is very friendly to small boaters. There are porte-potties at the site and water. Buck's Launching is at the mouth of Las Gallina's Creek (Gallina in Spanish means Chicken but the yellower, fattier and older kind of meat rather than the young, white meat or Pollo). Hence the muddy waters. I'm not sure about the history of Buck's but apparently it has been there for many years. It has closed now and the property is sold to the State Parks. Apparently there'll be a full state park area with small and big boat launch from this site. Take-out: There are multiple places to take out in Vallejo. Lots of Marinas and even more public ramps in Benicia. The Benecia Outrigger Club is a great resource around there. I'm not sure whether it would be okay to take out in the summer time at Glen Cove Marina, but in the winter there was no one there so the guest dock was open to the public. From Buck's Launching to Black Point Boat Ramp we see more of the same North Bay salt marshes along the way and enter into the San Pablo Bay with more nature reserves near the Napa River Valley. The view is expansive here because there are no buildings, no hills and just flat greenery. The water gets low and muddy. The color is pure brown especially in the winter with the Sacramento River Delta bringing plenty of mud in the runoff. On January 16, 2017, I paddled this stretch with Jim Robinson and Sandy Canchola. Jim paddled most of the way and went back on his own because his car was back at Buck's Launching. Sandy had a short inflatable river kayak and she paddled back to China Camp while her wife Sherrie drove the shuttle for her. We saw a lot of winter birds. The tides were minimal and so was the wind. Other than stimulating conversation with Jim, nothing too much to report. 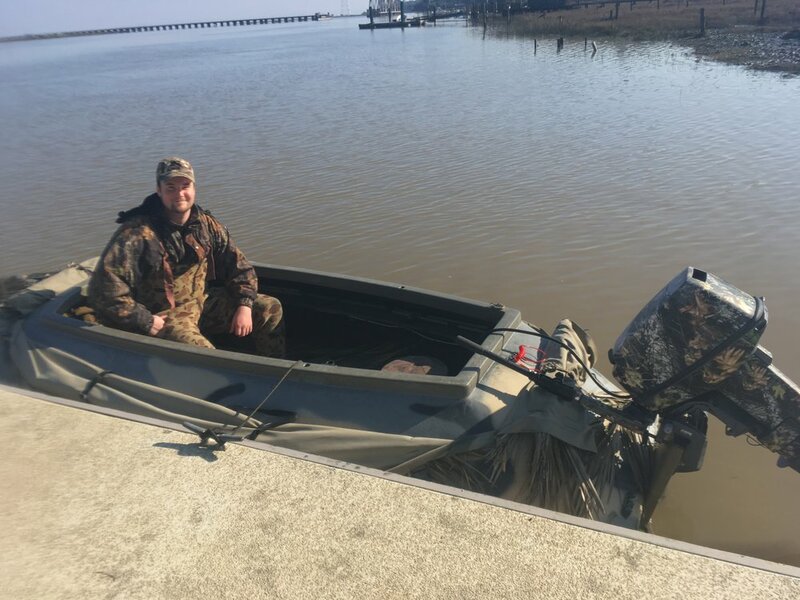 Hazards: Your usual piers and low tide issues in the bay, nothing too extraordinary than hunters with their duck houses in the water trying to kill ducks. Don't dress like ducks. Put-in: Outdoor Adventures has their put-in site at Buck's Launching and is very friendly to small boaters. There are porte-potties at the site and water. Buck's Launching is at the mouth of Las Gallina's Creek (Gallina in Spanish means Chicken but the yellower, fattier and older kind of meat rather than the young, white meat or Pollo). Hence the muddy waters. I'm not sure about the history of Buck's but apparently it has been there for many years. It has closed now and the property is sold to the State Parks. Apparently there'll be a full state park area with small and big boat launch from this site. From Buck's Launching, you can paddle several miles up the creek with great views of the marshes. The guides at OA told me that it's a very nice paddle. Take-out: Black Point Boat Ramp is located at the most of the Petaluma river. There is plenty of paddling to be done up the river. There's a lot of fishermen and hunters that utilize this nice ramp. They are pretty friendly to small boaters. Apparently the coast guards also put in here so make sure you wear your lifejackets! From San Rafael north, there is a lot of wilderness space in the North Bay. Marin county has seven islands, multiple wildlife refuge and lots of green space. It's a pleasure to paddle there. In this stretch of the paddle, you'll pass by the West and East Marin Islands, which is a wildlife refuge, Point San Pedro with the Sisters Islands, McNears Beach, China Camp with Rat Rock Island, and the beautiful China Camp marshes with the San Francisco Bay National Estuarine Research Reserve. You'll also pass by several hunting houses that are on the water, so be careful not looking like a duck in the spring. On January 15, 2017, I paddled from 101 Surf Sports to Buck's Launching with Angel Galvan Raich and her husband Bob met us a multiple points along the stretch on his board while driving their van to the take-out. It was a little challenging at first because the wind was pushing from the northeast but as soon as we round the corner from Point San Pedro it became really placid on the bay. The weather was nice and we had a really pleasant paddle with minimal tide currents. The scenery was really enjoyable and Bob even explored some of the tidal march channels. I saw multiple birds but the best was an Osprey along the edge of the marsh. Put-in: 101 Surf Sports is a great shop with a great community of paddlers and great gear for rental and retail. It's a mile into the San Rafael Creek. Take-out: Outdoor Adventures has their put-in site at Buck's Launching and is very friendly to small boaters. There are porte-potties at the site and water. Buck's Launching is at the mouth of Las Gallina's Creek (Gallina in Spanish means Chicken but the yellower, fattier and older kind of meat rather than the young, white meat or Pollo). Hence the muddy waters. I'm not sure about the history of Buck's but apparently it has been there for many years. It has closed now and the property is sold to the State Parks. Apparently there'll be a full state park area with small and big boat launch from this site.